Even though North Korea was warned by the international community not to do it, on Monday evening (PST) the country conducted its third nuclear test - a necessary requirement for building a functioning atomic weapon. 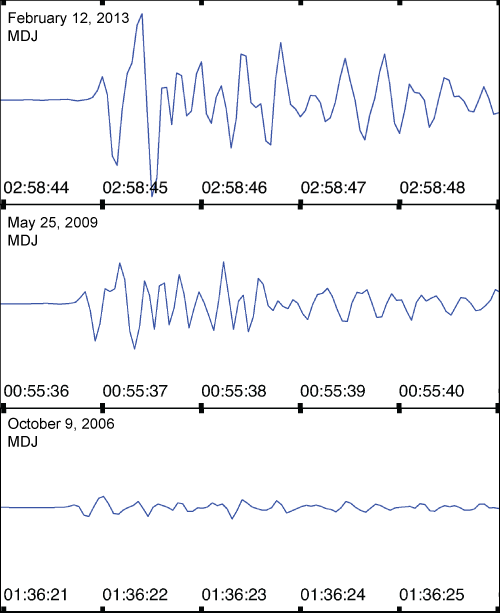 As with its two predecessors in 2006 and 2009 (see blog May 25, 2009), the latest test was again recorded by seismometers all around the world. Using common rules to calculate the strength of the blast, scientists at the USGS National Earthquake Information Center (NEIC) in Golden, Colo., determined that the latest detonation was equivalent to a tectonic earthquake with magnitude of 5.1. That makes it by far the strongest of the three tests which North Korea has conducted. 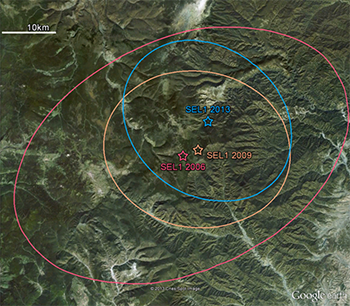 The previous two detonations had magnitudes of 4.3 and 4.7, respectively. 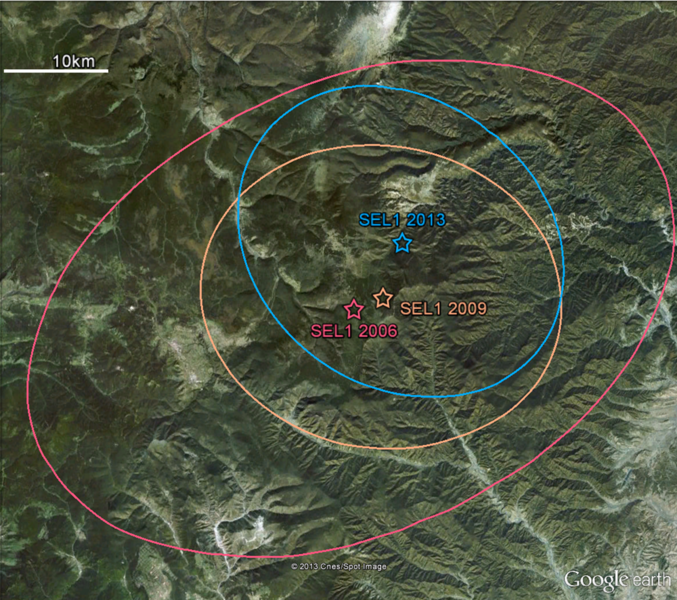 During the cold war, when mainly the US and the Soviet Union conducted hundreds of nuclear detonations at their respective test sites, seismologists found an empirical relationship between the calculated seismic magnitude and the yield of a nuclear device. Seismograms of the last three North Korean nuclear tests recorded on station MDJ, near Mudanjiang, China, about 370 km north-northeast of the test site. One can see them getting progressively bigger. According to this scale, an event with a magnitude of 5.1 corresponds to a nuclear weapon with a yield between 5 and 7 kilotons. These values are between one third and half the yield of the atomic bomb, which destroyed the Japanese city of Hiroshima in August 1945. Given the increase in magnitude of the three successive North Korean nuclear tests, it seems that the yields of their atomic devices have consistently gotten stronger.